Hebe albicans is widely available at garden centres. 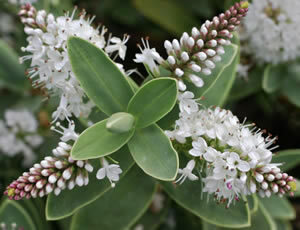 It forms a much-branched, bushy, evergreen shrub, about 18 in (45 cm) wide and 12 in (30 cm) high. The leaves are grey-green, oval, thick, about 1 in (25 mm) long, and 0.5 in (12 mm) wide. In June and July it bears stubby spikes of white flowers. The flower buds are reddish. A hebe fully hardy in the UK. This hebe grows in the mountains of Nelson, at the north of the South Island of New Zealand.